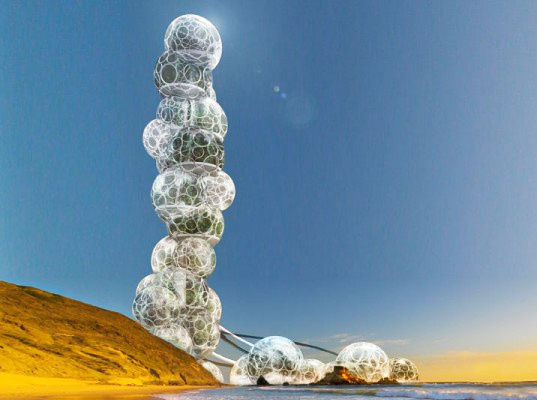 French firm Design Crew for Architecture has designed a novel water purifying tower. It consists of a series of large spheres attached to pillars. Brackish water is pumped up the tower, taken up by mangroves growing in the spheres, and transpired. Purified condensation is then collected for drinking or irrigation. Mangroves are chosen because of their tolerance of saline and brackish water. The design sure looks cool. And if it wasn’t for creative thinking we’d be stuck back in the 1980s. But the commenters at BoingBoing are roundly panning the design, myself included. The designers really don’t understand botany or engineering. Indeed. Plant transpiration is typically slower than evaporation from a saturated surface. It can be faster only if the canopy is elevated into air with much greater wind speed or solar exposure, neither of which apply here. This is just art, not design.